3-Frank Henry Walker was born on 18 Aug 1879 in Westbury, Tasmania, died on 17 Feb 1945 in Drumreagh, Deloraine at age 65, and was buried in Feb 1945 in General Cemetery, Deloraine D101/559. 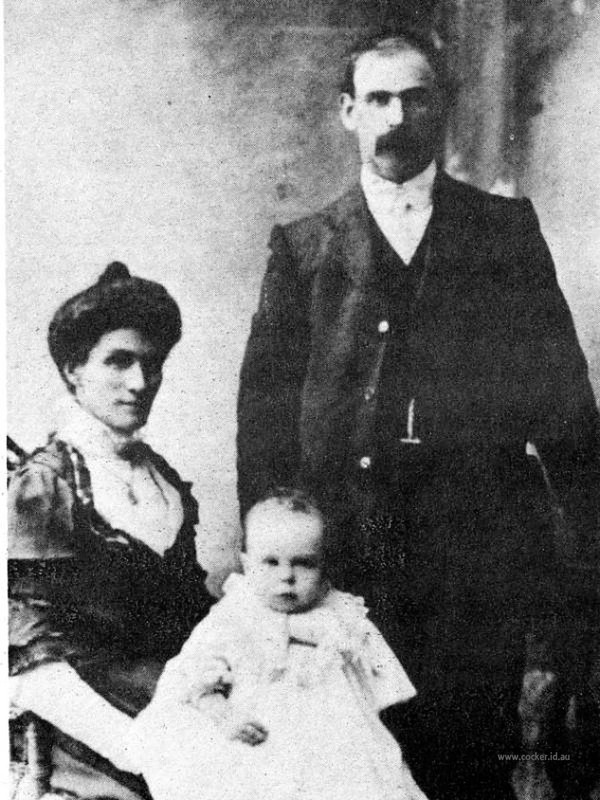 Frank married Mary Paton McFarlane, daughter of James McFarlane and Janet Thompson, on 26 Sep 1906 in Hagley, Tasmania. Mary was born on 9 Jul 1871 in Westbury, Tasmania, died on 2 Sep 1951 at age 80, and was buried in Sep 1951 in General Cemetery, Deloraine D101/559. Another name for Mary was Martha. Frank worked for a time for Hedley von Bibra, at Ulverstone, and later farmed at Kimberley; Fairleigh, Dunorlan; and Drumreagh, River Road, Deloraine, where he died in 1945. Frank and cousin Norman Walker apparently worked together in some sort of partnership involving the raising and butchering of cattle. Jack has a few fragmentary memories of an occasion on which Frank and Norman's families met at a cattle slaughtering, probably at Kimberley, using an unoccupied house as a temporary headquarters. Frank's wife Martha and Norman's Louie were present, also two of three kids from each family, and there was an old D-shaped sheet iron tank, which fortunately contained sufficient water for Martha to scrub the kids' faces before lunch. Not that she used much water. The families were so obsessed with the need to save rain water that a couple of inches of water in a battered old enamel dish was made to suffice, used in succession by all concerned. Martha gave each of three frankly rebellious little boys a vigorous scrub, using a tattered piece of old rag as a washer, and an equally vigorous rub with a towel that had seen better days. Her stocks rose a bit in the lads' estimation when she produced some very tasty cold mutton, cut into small squares, and chopped up potato onion, which Jack was experiencing for the first time. No recollection of grace, which would inevitably have been said, and equally inevitably have been regarded by the boys as not worth remembering, and no recollection of seeing the cattle slaughtered and dressed; a positive indication that the boys weren't allowed on the scene, probably because their mothers were present, as all would previously have seen animals slaughtered, and Jack in particular was used to seeing dead animals dissected and discussed prior to burial. Norman and Frank sometimes referred nostalgically to the occasion in later years — "one of the times we cleared a nice little cheque". When Norman went broke, Frank obliged him by "taking a bit of stuff', i.e. concealing a few of Norman's possessions until the selling-up process was over and creditors' demands had died down. On one occasion Norman and Jack spent the night at Frank's on the way home from the coast. Frank was away, but had left a beast's carcass to be cut up on the following morning, a task Frank's boys allegedly avoided if they could. Norman took over the task with relish, throwing in a lecture on anatomy, and expressing the opinion, quite seriously, that all surgeons should be apprenticed to butchers for at least 18 months before being allowed to practice on people. Incidentally, the gun was under the seat, and a rifle along the back of the seat, for the benefit of anyone Norman's associate might have put into the old homestead (The Camp), during Norman's absence. Fortunately things never quite came to the use of firearms, nor did Norman ever "get any of the stuff home", and Grandfather McFarlane's bitzy old gun was stolen during the process of moving out to Ashburn. The abiding impression of a visit to Frank's was the warmth and friendliness of the reception, worth travelling miles to experience. 4-William James Walker was born on 9 Apr 1908 in Buckland, Tasmania, died on 5 Aug 1978 in Deloraine Hospital at age 70, and was buried on 8 Aug 1978 in Lawn Cemetery, Deloraine, Tasmania. William married Lorna Elizabeth Martha Crocker, daughter of Henry Crocker and Sarah Jane McKay, on 20 Aug 1942 in Methodist Church, Deloraine. Lorna was born on 18 Dec 1912 in Lanoma, Deloraine, died on 16 Feb 1989 in her garden, Deloraine, Tasmania at age 76, and was buried on 19 Feb 1989 in Lawn Cemetery, Deloraine, Tasmania. They had two children: Geoffrey James and Frank Henry. 5-Geoffrey James Walker was born on 16 Nov 1943 and was christened on 21 Mar 1994 in Methodist Church, Deloraine. Geoffrey married Robin Ann McGiveron, daughter of Les McGiveron and Ila Dorothy Stevens, on 11 Jul 1964 in St. Paul's Church of England, Cleveland Street, Launceston. Robin was born on 13 Jun 1945 and was christened on 4 Dec 1949 in St. Marys Church of England, Hagley. They had two children: Christopher Glenn and Paul. 6-Christopher Glenn Walker was born on 18 Jan 1965 in Queen Victoria Maternity Hospital, Launceston and was christened on 13 Jun 1965 in Methodist Church, Deloraine. Christopher married Justine Lee Wilton on 19 Mar 1988. Justine was born on 23 Oct 1968 in Calvary Hospital, Hobart, Tasmania. They had one son: Jolan Peter. 7-Jolan Peter Walker was born on 4 Nov 1988 in Queen Victoria Maternity Hospital, Launceston. 6-Paul Walker was born on 17 Apr 1967 in Queen Victoria Maternity Hospital, Launceston and was christened in Nov 1967 in Methodist Church, Deloraine. Paul married Janine Margaret Carey on 19 Jan 1991 in St. Aidans Church, Launceston. Janine was born on 2 Mar 1965 and was christened on 16 Feb 1997 in St. Marys Church of England, Hagley. They had one daughter: Haylee Margaret. 7-Haylee Margaret Walker was born on 12 May 1996. 5-Frank Henry Walker was born on 7 Jun 1945 in Arcoona Hospital, Deloraine. Frank married Beverley Cook on 10 Oct 1970 in Deloraine, Tasmania. Beverley was born on 25 Jun 1949 in Deloraine, Tasmania. They had two children: Grant Andrew and Ricky James. 6-Grant Andrew Walker was born on 31 Oct 1973 in Queen Victoria Maternity Hospital, Launceston. Grant married Kellie Nicholas. They had two children: Jack Henry and Ryan John. 7-Jack Henry Walker was born on 17 Apr 2004 in Queen Victoria Maternity Hospital, Launceston. 7-Ryan John Walker was born on 28 Nov 2008 in Queen Victoria Maternity Hospital, Launceston. 6-Ricky James Walker was born on 2 Apr 1976 in Queen Victoria Maternity Hospital, Launceston. Ricky married Jacqueline Louise Kettle on 10 Jul 2007 in St Marks Church of England, Deloraine. Jacqueline was born on 17 Mar 1975 in Queen Victoria Maternity Hospital, Launceston. They had two children: Chloe Louise and Joshua James. 7-Chloe Louise Walker was born on 17 Aug 2006 in Queen Victoria Maternity Hospital, Launceston and was christened on 10 Jul 2007 in St Marks Church of England, Deloraine. 7-Joshua James Walker was born on 15 Dec 2008 in Queen Victoria Maternity Hospital, Launceston. 4-Frank Trevor Walker was born on 3 Oct 1909 in Blackmoor, Deloraine, died on 3 Oct 1960 in the Launceston General Hospital at age 51, and was buried in Oct 1960 in General Cemetery, Deloraine D101/887. Frank married Thelma May Cole, daughter of Victor Thomas Cole and Alice Maud Heger, on 16 Jan 1936 in Elizabeth Town, Tasmania. Thelma was born on 16 Mar 1915 in Deloraine, Tasmania, died on 8 Jan 1988 in Burnie Hospital at age 72, and was buried in Jan 1988 in General Cemetery, Deloraine D101/887. They had three children: Judith Ann, Peter Trevor and Rodney John. 5-Judith Ann Walker was born on 10 Nov 1941 in Arcoona Hospital, Deloraine. Judith married Reginald Mahoney in Catholic Church, Deloraine, Tasmania. Reginald was born on 11 Sep 1935 and died about 1999 aged about 64. They had three children: Katrina, Christopher and Janine. 6-Katrina Mahoney was born on 16 Apr 1964. Katrina married Kim Barker. Kim was born on 9 Oct. They had two children: Lewis Trevor and Eithan. 7-Lewis Trevor Barker was born on 3 Jul 1993. 6-Christopher Mahoney was born on 20 May 1968 in Devonport. Christopher married Keryn Maree Wooley. 6-Janine Mahoney was born on 22 Sep 1971 in Devonport. 5-Peter Trevor Walker was born on 20 Nov 1945 in Arcoona Hospital, Deloraine. Peter married Ailsa Noelle Collins on 9 Jan 1971 in St. John the Baptist Church, Buckland. Ailsa was born on 23 Dec 1947 in Ringwood, Victoria. They had two children: Danielle and Stuart Campbell. 6-Danielle Walker was born on 22 Aug 1973 in Port Moresby, New Guinea. 6-Stuart Campbell Walker was born on 3 Jun 1976 in Launceston. Stuart married Wendy Megan Apelt on 11 Nov 2000 in Boronia, Victoria. 5-Rodney John Walker was born on 5 Apr 1950 in Arcoona Hospital, Deloraine. Rodney married Wendy Jean McCall in Devonport. Wendy was born on 8 Jul 1950. They had three children: Grant Rodney, Anthony Roy and Terry James. 6-Grant Rodney Walker was born on 7 Oct 1969. Grant had a relationship with Vanessa Spaulding. They had one daughter: Morgan. Grant next married Donna Cormwell. They had two children: Renee and aron. 6-Anthony Roy Walker was born on 21 Apr 1971 in Devonport. Anthony married Georgette in Greek Othodist Church, Kew, Victoria. They had two children: Brayden and Dylan. 6-Terry James Walker was born on 21 Apr 1971 in Devonport. 4-Edith Janet Walker was born on 27 Mar 1911 in Hagley, Tasmania, died on 8 Aug 1988 in Devonport at age 77, and was buried on 10 Aug 1988 in Mersey Vale Lawn Cemetery, Devonport. Edith married Cyril Jack Fair, son of William Fair and Ada Cecila Atkins, on 26 Jun 1935 in Deloraine, Tasmania. Cyril was born on 28 Jul 1909 in Dunorlan, Tasmania, died on 10 Dec 1984 in Mersey General Hospital, Latrobe at age 75, and was buried on 12 Dec 1984 in Mersey Vale Lawn Cemetery, Devonport. Another name for Cyril was Jack. They had six children: Thomas John, Margaret, Heather Joyce, William Frank (Bill), Elizabeth and Helen. 5-Thomas John Fair was born on 6 Nov in Deloraine, Tasmania and died (stillborn). 5-Margaret Fair was born on 9 Jul 1936 in Deloraine, Tasmania. Margaret married Graham Leslie Hooper, son of Elliott Hooper and Jean Lawrence, on 6 Oct 1956 in Pine Road, near Penguin. Graham was born on 10 Dec 1932 in Devonport. They had six children: David Graham, Peter Anthony, Malcolm John, Christopher William, Lawrence James and Marianne Margaret. 6-David Graham Hooper was born on 13 Sep 1957 in Burnie, Tasmania. David married Janice Elizabeth Walker, daughter of Claude Robert Walker and Kathleen Adella Wells, on 11 Mar 1977 in Methodist Church, Devonport. Janice was born on 21 Nov 1959 in Devonport. They had four children: Christie Adele, Mathew David, Andrew Graham and Katie Elizabeth. 7-Christie Adele Hooper was born on 15 Jul 1981 in Devonport. Christie married Jarrod Clark in Devonport. They had two children: Indya Adele and Harley Rose. 8-Indya Adele Clark was born on 8 Jun 2002. 8-Harley Rose Clark was born on 12 Mar 2010. 7-Mathew David Hooper was born on 30 Nov 1983 in Devonport. 7-Andrew Graham Hooper was born on 7 Mar 1985 in Devonport. Andrew married Samantha Weaver. They had one son: Noah David. 8-Noah David Hooper was born in Feb 2011. 7-Katie Elizabeth Hooper was born on 21 May 1987 in Devonport. 6-Peter Anthony Hooper was born on 25 Apr 1959 in Burnie, Tasmania, died in Devonport, and was buried in Devonport. Peter married Roxanne Latham, daughter of John Latham and Mildred, on 31 Aug 1979 in Devonport. Roxanne was born on 19 Apr 1960. They had two children: Shannon Emily and Kerrie-Louise. 7-Shannon Emily Hooper was born on 7 Sep 1982 in Devonport. 7-Kerrie-Louise Hooper was born on 9 Nov 1983 in Devonport. Peter next married Colleen Harrod on 26 Mar 2005. 6-Malcolm John Hooper was born on 26 Nov 1960 in Burnie, Tasmania. Malcolm married Suzanne Wright, daughter of Raymond Wright and Valma, on 31 Dec 1983 in Devonport. Suzanne was born on 9 Apr 1962 in Devonport. They had two children: Sara Kate and Adam John. 7-Sara Kate Hooper was born on 21 Oct 1987 in Devonport. 7-Adam John Hooper was born on 19 Nov 1989 in Devonport. 6-Christopher William Hooper was born on 11 Jun 1964 in Burnie, Tasmania. 6-Lawrence James Hooper was born on 1 Dec 1965 in Burnie, Tasmania. Lawrence married Jacqueline Lade, daughter of Anthony Lade and Sandra, on 4 Feb 1989 in Devonport. Jacqueline was born on 13 Oct 1966 in Launceston. They had two children: Danielle Anne and Caitlyn Rose. 7-Danielle Anne Hooper was born on 20 Apr 1993 in Latrobe. 7-Caitlyn Rose Hooper was born on 26 Jun 1995 in Latrobe. 6-Marianne Margaret Hooper was born on 27 Jan 1971 in Devonport. Marianne married Michael Donohue on 17 Nov 2001 in Latrobe. Michael was born on 23 Dec 1970. They had two children: Rebecca Ann and Jesica Lee. 7-Rebecca Ann Donohue was born on 18 Jul 1996 in Burnie, Tasmania. 7-Jesica Lee Donohue was born on 2 Aug 1999 in Devonport. 5-Heather Joyce Fair was born on 26 Oct 1939 in Deloraine, Tasmania, died on 1 Nov 1939 in Deloraine, Tasmania, and was buried in Nov 1939 in Public Cemetery, Deloraine, Dl01-0591. 5-William Frank (Bill) Fair was born on 10 Oct 1942 in Deloraine, Tasmania. William married Frances Freda Cresswell on 3 Jul 1965 in Launceston. Frances was born on 31 May 1945 in Tasmania. They had two children: Lorraine and Heather Ann. 6-Lorraine Fair was born on 8 Aug 1966 in Burnie, Tasmania. Lorraine married Dean Robert Wilson on 8 Feb 1997 in Devonport. Dean was born on 16 Mar 1965 in Devonport. They had two children: Rebecca Ann and Jessica Lee. 7-Rebecca Ann Wilson was born on 18 Jul 1996 in Burnie, Tasmania. 7-Jessica Lee Wilson was born on 2 Aug 1999 in Devonport. 6-Heather Ann Fair was born on 13 Feb 1968 in Devonport. Heather married Leigh Charles Jenkins, son of Derek Jenkins and Brenda, on 28 Feb 1987 in Devonport. Leigh was born on 21 Apr 1965 in Devonport. They had three children: Nathan Leigh, Ashley Darrel and Shantelle Frances Lorraine. 7-Nathan Leigh Jenkins was born on 25 Aug 1988 in Devonport. 7-Asheley Darrel Jenkins was born on 8 Sep 1989 in Devonport. 7-Shantelle Frances Lorraine Jenkins was born on 13 Feb 1992 in Devonport. 5-Elizabeth Fair was born on 25 Mar 1945 in Deloraine, Tasmania. Another name for Elizabeth is Betty. Elizabeth married Roland De Groot on 17 Aug 1974 in Pine Road, near Penguin. Roland was born on 31 Jul 1939 in Rotterdam, Netherlands. They had two children: Suzanne and Scott. 6-Suzanne De Groot was born on 23 Dec 1976 in Burnie, Tasmania. Suzanne married Terry Russell. They had one son: Hogan Terrance William. 7-Hogan Terrance William Russell was born in Jan 2004. 6-Scott De Groot was born on 24 Feb 1977 in Burnie, Tasmania. Scott married Tammy Jeffery on 11 Oct 1997 in Penguin. They had two children: Tyson Scott and Jake Roland. 7-Tyson Scott De Groot was born on 13 Nov 1999. 7-Jake Roland De Groot was born on 3 Feb 2001. 5-Helen Fair was born on 25 Apr 1952 in Deloraine, Tasmania and died on 25 Apr 1952 in Deloraine, Tasmania. 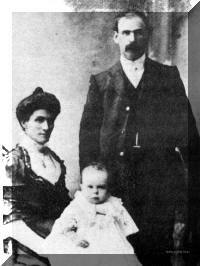 4-Jack Thompson Walker was born on 20 Jul 1913 in Kimberley and died on 5 Aug 1916 in Latrobe Hospital at age 3. 4-Maxwell Alvin Walker was born on 20 Jul 1917 in Kimberley, died on 7 Apr 1980 in Possibly Port Sorell, Tasmania at age 62, and was buried in Apr 1980 in Lawn Cemetery, Deloraine, Tasmania. Maxwell married Daphne Ellen Tierney. Daphne was born on 5 Jul 1922, died on 14 Apr 2008 in the Launceston General Hospital at age 85, and was buried on 18 Apr 2008 in Lawn Cemetery, Deloraine, Tasmania. They had three children: Alvin Ernest, Graeme Frank and Keverall Claude. 5-Alvin Ernest Walker was born on 14 Sep 1941, died on 30 Jun 2001 in North West General Hospital, Burnie at age 59, and was buried on 3 Jul 2001 in Burnie Lawn Cemetery. In the death notices in the newspaper in Tasmania the following message was placed. "Two loving eyes are sleeping, a weary heart is still. The hands that did so much for us, now resting at God's will. You are the wind beneath my wings, "Cobber". Safe harbour". Margaret and Alvin were building a beautiful Huon Boat on a block at Port Sorell and they were going to sail around Australia. Alvin died after a long battle with a brain tumour. Alvin's wife, Margaret, children Carol and Brian Tarrant, Philip and Jodi e, Kerry and Nicole had his mother Daphne, find it extremely difficult to adequately express their deep gratitude to all those who offered their support following the sad and sudden loss of their loved one. Special thanks to Community Health Nurses, Palliative Care, Medical Ward staff NWRH, Rachel, Renne's at Parkside Funerals for her guidance and uncanny insight. Geoff Mathies for presenting the eulogy, Jim for playing the bagpipes and to Fr. Robert for leading us through a celebration of Alvin's life at the Mass. We were honoured by the numerous cards and flowers received and the esteem shown to Alvin by the many people who attended his funeral service and donated to Cancer Research. OUR HEARTFELT THANKS AND APPRECIATION TO ALL. Alvin married Margaret Anne Bennett. Margaret was born on 6 Oct 1943. They had three children: Carol Anne, Philip Alvin and Kerry Bruce. 6-Carol Anne Walker was born on 10 Jul 1966. Carol married Brian Tarrett. Brian was born on 30 Apr 1963. They had two children: Jordan Lee and Brooke. 7-Jordan Lee Tarrett was born on 16 Aug 1993. 7-Brooke Tarrett was born about 1998. 6-Philip Alvin Walker was born on 18 Feb 1969. Philip married Jodie. 6-Kerry Bruce Walker was born on 9 Aug 1970. Kerry married Nicole. 5-Graeme Frank Walker was born on 28 Jan 1945. Graeme married Sonya Iwanczyk. Sonya was born on 17 Sep 1947. They had two children: Lisa Maree and Glen Andrew. 6-Lisa Maree Walker was born on 19 Jan 1969. 6-Glen Andrew Walker was born on 19 Jun 1970. Glen married Louise. 5-Keverall Claude Walker was born on 27 Jan 1947 in Perth, died on 22 Nov 1992 in Toowoomba, Queensland at age 45, and was buried in Nov 1992 in Garden of Remembrance Cemetery, Toowoomba, Queensland. Keverall married Sonia Dawn Butters on 10 Oct 1970 in Sydney, New South Wales. Sonia was born on 1 Sep 1947 in Brisbane, Queensland. They had two children: Dale Geoffrey and Carli Maree. 6-Dale Geoffrey Walker was born on 23 Dec 1972 in Devonport. Dale married Toni Smith on 15 Apr 1995 in 1650 Upper Kandanga Road Via Gympie, Queensland. Toni was born on 9 May 1970 in Kilcoy, Queensland. They had two children: Mickayla Maree and Kira-Lee Meagan. 7-Mickayla Maree Walker was born on 22 Mar 2000 in St. Vincents Hospital, Toowoomba, Queensland. 7-Kira-Lee Meagan Walker was born on 29 Apr 2002 in St. Vincents Hospital, Toowoomba, Queensland. 6-Carli Maree Walker was born on 19 Dec 1975.